This article is about background checks for private sales of firearms in the United States. For background checks in general, see Background check. Proposals for universal background checks would require almost all firearms transactions in the United States to be recorded and go through the National Instant Criminal Background Check System (NICS), closing what is sometimes called the private sale exemption. Currently, federal law requires background checks (through the National Instant Criminal Background Check System) only for guns sold through licensed firearm dealers, which account for 78% of all gun sales in the United States. This figure was published in a 2017 study by the Annals of Internal Medicine which compared data from 1994, indicating 40% of recent gun acquisitions were completed without a background check, to a 2015 survey which found that 22% of recent gun transfers (purchased and nonpurchased) were completed without a background check. The current federal law allows people not "engaged in the business" of selling firearms to sell firearms without a license or records. The Coalition to Stop Gun Violence (CSGV) states that the National Instant Criminal Background Check System has prevented over two million felons and other prohibited persons from purchasing firearms. According to the CSGV, the law also has a prohibitive effect, that deters illegal purchases. In November 1998, President Bill Clinton directed the U.S. Secretary of the Treasury and the U.S. Attorney General (A.G.) to provide recommendations concerning the fact that 25 percent or more of sellers at gun shows are not required to run background checks on potential buyers. This was called the gun show loophole. :3,12:27 Two months later, Gun Shows: Brady Checks and Crime Gun Traces was released. The Secretary and the A.G. made seven recommendations, including expanding the definition of "gun show," and reviewing the definition of "engaged in the business." After the Columbine High School massacre in April 1999, gun shows and background checks became a focus of national debate. In May, the executive vice president of the National Rifle Association (NRA) told the House Judiciary Subcommittee on Crime, "We think it is reasonable to provide mandatory, instant criminal background checks for every sale at every gun show. ":118 Those concerned about the shows believed they were a source of illegally trafficked firearms. [nb 1] Efforts to reverse a key feature of the Firearm Owners Protection Act (FOPA) by requiring criminal background checks and purchase records on private sales at gun shows, which had become prolific in the U.S. since the law's passage in 1986, were unsuccessful. Drawbacks with respect to expense and inconvenience notwithstanding, 83% of self-reported gun owners and 87% of the general population endorsed regulation for all private-party gun sales in a 2008 poll that was conducted for the advocacy organization Mayors Against Illegal Guns. Gun owners gave stronger support to this all-inclusive approach than to a gun-show-only proposal in a 2009 poll conducted for the same organization. Either proposal would face tough sledding on Capitol Hill. It would therefore seem preferable to move forward with the version that is most likely to reduce the rates of firearm-related violence. Following the December 14, 2012 Sandy Hook Elementary School massacre, there were numerous calls for universal background checks to close what is now referred to as the "private sale loophole." 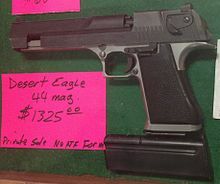 In an essay published in 2013, Wintemute said that comprehensive background checks that included private sales would result in a simple, fair framework for retail firearms commerce. :103 In February 2014, researchers at the Johns Hopkins Center for Gun Policy and Research reported that after the 2007 repeal in Missouri of a long-standing law that required all handgun buyers to pass a background check there was a 23 percent increase in firearms homicides. In 2017, a study by researchers from Northeastern University and the Harvard School of Public Health showed that 22% of American gun owners who had obtained a gun in the previous two years did not undergo a background check before doing so. Universal background checks enjoy high levels of public support; a 2016 representative survey found 86% of U.S. registered voters supported the measure. Five national polls conducted in 2015 show high levels of support for "expanded background checks for gun purchases," with rates varying (93% and 89% support in two Quinnipiac University surveys, 92% support in a CBS/New York Times survey, 86% support in a Gallup survey, 85% support in a Pew Research Center survey). A 2015 survey found that more than 90% of Americans supported universal background checks, and that, on average, Americans thought they would be more effective than any other gun policy. There is evidence that many Americans incorrectly think that universal background checks are required by federal law; a 2016 survey found that 41% of Americans believed this to be the case. The same survey found that 77% of Americans supported universal background checks, while only 53% supported stricter gun laws. Based on this data, the authors concluded that "this difference might be attributable to poor awareness of the limitations of existing laws." In 2015, large majorities of American adults, both Republicans (79%) and Democrats (88%), supported background checks for private sales and at gun shows, according to a Pew Research Center survey. In 2017, strong majorities of American adults, both gun owners (77%) and non-gun owners (87%), supported background checks for private sales and at gun shows, according to a Pew Research Center survey with an error attributable to sampling of +/- 2.8% at the 95% level of confidence. In 2018, after the Stoneman Douglas High School shooting in Parkland, Florida, nearly all Americans supported universal background checks. 88% of registered voters supported universal background checks, according to a Politico/Morning Consult poll with a margin of error +/- 2%. 97% of American voters supported universal background checks, according to a Quinnipiac University Polling Institute poll with a margin of error of +/- 3.4%. Those who oppose universal background checks argue that existing gun laws are sufficient; that the government does not prosecute enough of the attempted buyers who are turned away by the current system; that background checks are an invasion of privacy; that "transfer" might be defined too broadly. Opponents also maintain that universal background checks would not stop crime and assert that the only way to properly enforce a universal system would be to require a registration database. Gun-rights advocate and author John Lott argues that universal background checks prevent poorer Americans from acquiring guns. Lott said that, as of December 2015, background checks added an effective cost of $80 (New York), $60 (Washington state), or $200 (Washington, D.C.) to transferring a firearm. Lott argues that universal background checks are an effective tax on guns and can prevent less affluent Americans from purchasing them, and that this disproportionately affects poor minorities who live in high-crime urban areas. Some local counties have adopted Second Amendment sanctuary resolutions in opposition to universal background check laws. A study published in October 2018 conducted by the Violence Prevention Research Program (VPRP) at UC Davis and the Johns Hopkins Bloomberg School of Public Health found no change in firearm homicide or suicide rates in the ten years following California's 1991 implementation of comprehensive background checks. The study's control group used firearm and non-firearm mortality data for 32 states that did not implement major firearm policies during the period from 1981-2000. In the study period, firearm suicide rates were 10.9 percent lower in California but a similar decrease in non-firearm suicide was also observed. The study found no net difference between firearm-related homicide rates before and during the study period. The study authors identified a number of possible reasons for the null finding, including inadequate reporting of criminal records or other disqualifying information to background-check databases (especially pre-2000); a failure by sellers to conduct the background check as required by law; and the small number of persons affected by the California law. Another study by the VPRP found that comprehensive background check policies led to increased background checks in Delaware, but not in Colorado or Washington. Non-compliance with the policy may be attributable to the lack of an increase in the latter two states. A study published in July 2018 found no association between firearm homicide and suicide rates and the repeal of comprehensive background check laws in two states. The study compared rates from synthetic control groups to rates in Indiana from 1981 to 2008 and in Tennessee from 1994 to 2008. Rates from the two states' study periods were within the range of natural variability. The study also concluded that in order to understand whether comprehensive background checks generally reduce firearm deaths, more evidence from other states is needed. In a 2017 survey, a panel of 32 scholars of criminology, public health and law rated universal background checks as the most effective policy to prevent gun deaths, ranking it #1 of 29 possible gun-related policies. Research demonstrates that background check laws may be effective in decreasing gun homicides and suicides. A 2015 study published in the American Journal of Public Health found that a Connecticut law (enacted in 1995) requiring handgun buyers to undergo a background check (in order to obtain a required permit) "was associated with a 40 percent decline in gun homicides and a 15 percent drop in suicides" during the law's first ten years in effect. A 2014 study published in the Journal of Urban Health found that the 2007 repeal of a "permit-to-purchase" handgun law in Missouri (including the repeal of a background-check requirement) was associated with a 23% increase in the firearm homicide rate and a 15% increase in the murder rate, translating "to increases of between 55 and 63 homicides per year in Missouri." The study controlled for other variables that might affect homicides, including "changes in rates of unemployment, poverty, incarceration, burglary, law enforcement officers per capita, and the presence of four other types of state laws." Universal background check laws, which require that a background check be conducted before any gun transfer, may apply to temporary removals of guns from the home of suicidal individuals. Some clinicians have reported that these laws have created confusion about whether a gun transfer would be legal, and therefore made it more difficult for them to counsel their patients. ^ A report released in 2009, 10 years after Columbine, discussed the role that gun shows play in trafficking to Mexico. ^ "Gun Show undercover" (PDF). October 2009. p. 11. Retrieved June 26, 2014. ^ a b "Firearms Trafficking: U.S. Efforts to Combat Arms Trafficking to Mexico Face Planning and Coordination Challenges" (PDF). gao.gov. United States Government Accountability Office (GAO). June 2009. GAO-09-709. Retrieved June 27, 2014. ^ LaPierre, Wayne (May 27, 1999). "Statement of Wayne LaPierre, Executive Vice President, National Rifle Association". commdocs.house.gov (Testimony). Washington, D.C. Retrieved July 4, 2014. No loopholes anywhere for anyone. ^ "Following the Gun: Enforcing Federal Laws Against Firearms Traffickers" (PDF). Bureau of Alcohol, Tobacco, Firearms and Explosives (ATF). June 2000. Archived from the original (PDF) on March 31, 2003. ^ Olinger, David (February 13, 2000). "Dealers live for gun shows". Denverpost.com. Retrieved January 29, 2015. ^ Baum, Dan (June 8, 2000). "What I saw at the gun show". rollingstone.com. Retrieved January 30, 2015. ^ a b Wintemute, Garen J.; Braga, Anthony A.; Kennedy, David M. (August 5, 2010). "Private-Party Gun Sales, Regulation, and Public Safety". The New England Journal of Medicine. Massachusetts Medical Society. 363 (6): 508–511. doi:10.1056/NEJMp1006326. PMID 20592291. Published online at nejm.org on June 30, 2010. ^ Hartfield, Elizabeth (December 24, 2012). "In Gun Control Debate, Arguments for Tougher Background Checks, Better State Reporting". ABC News Internet Ventures. Retrieved June 27, 2014. ^ Sullum, Jacob (January 11, 2013). "4 Questions About 'Universal Background Checks' for Gun Purchases". Reason.com (Blog). Reason Foundation. Retrieved June 27, 2014. Avlon, John (January 12, 2013). "Gun debate still rages after Sandy Hook slaughter". The Telegraph. Telegraph Media Group. Retrieved June 27, 2014. Sullivan, Cheryl (January 12, 2013). "Gun debate 101: Time for 'universal' background checks on buyers?". Christian Science Monitor. Christian Science Monitor. Retrieved June 27, 2014. Martinez, Michael (January 28, 2013). "'Universal background check:' What does it mean?". Cable News Network. Retrieved June 27, 2014. ^ Fisher, Kristin (December 15, 2011). "Illegal Internet Gun Sales are Soaring in Virginia". WUSA9. Archived from the original on February 8, 2015. Retrieved February 7, 2015. These Internet sales really are the new gun shows. ^ Shapiro, Eliza (November 29, 2012). "Gun-Control Lobby Targets Obama, Demands Reform". Daily Beast. Kirkham, Chris (December 21, 2012). "Private Gun Sale Loophole Creates Invisible Firearms Market, Prompts Calls For Reform". The Huffington Post. "Universal Background Checks & the Private Sale Loophole Policy Summary". Smart Gun Laws. Law Center to Prevent Gun Violence. August 21, 2013. Retrieved January 28, 2015. Taylor, Marisa (December 22, 2014). "Gun law loophole could have provided Brinsley's murder weapon, say experts". Al Jazeera America. Through something known as the private sale loophole, he could have purchased the firearm in the private market at a gun show or out of someone’s trunk. Dobbs, Taylor (January 16, 2015). "Gun Rights Group Slams Proposed Legislation". Vermont Public Radio. ^ Wintemute, Garen J. (2013). "Comprehensive Background Checks for Firearm Sales: Evidence from Gun Shows". In Webster, Daniel W.; Vernick, Jon S. (eds.). Reducing Gun Violence in America. JHU Press. pp. 95–107. ISBN 978-1-4214-1110-1. OCLC 823897002. ^ Webster, Daniel (February 18, 2014). "ID Check Repeal Prompts Spike In Murders, Study Finds". All Things Considered (Interview). Interviewed by Audie Cornish. NPR. Retrieved June 30, 2014. ^ Miller, M; Hepburn, L; Azrael, D (3 January 2017). "Firearm Acquisition Without Background Checks: Results of a National Survey". Annals of Internal Medicine. 166 (4): 233–239. doi:10.7326/M16-1590. PMID 28055050. ^ a b Cite error: The named reference BuiSangerKatz was invoked but never defined (see the help page). ^ Carroll, Lauren (5 January 2016). "Laura Ingraham wrongly says claim that 90% support for gun background checks has been debunked". Politifact. Retrieved 7 January 2016. ^ Sorenson, Susan B. (October 2015). "Assessing views about gun violence reduction policy: A look at type of violence and expected effectiveness". Preventive Medicine. 79: 50–54. doi:10.1016/j.ypmed.2015.04.025. PMID 25952054. ^ Aronow, Peter M; Miller, Benjamin T (January 2016). "Policy misperceptions and support for gun control legislation". The Lancet. 387 (10015): 223. doi:10.1016/S0140-6736(16)00042-8. ^ Fingerhut, Hannah (January 5, 2016). "5 facts about guns in the United States". Pew Research Center. Retrieved March 29, 2018. ^ Parker, Kim; Menasce Horowitz, Juliana; Igielnik, Ruth; Oliphant, Baxter; Brown, Anna (June 22, 2017). "America's Complex Relationship With Guns". Pew Research Center. Retrieved March 24, 2018. ^ a b Shepard, Steven (February 28, 2018). "Gun control support surges in polls". Politico. Retrieved March 19, 2018. Eighty-eight percent support requiring background checks on all gun sales. ^ a b Good, Chris (April 10, 2013). "The Case Against Gun Background Checks". ABC News Internet Ventures. Retrieved June 30, 2014. ^ Lott, John (2015-12-03). "Mass Shootings and Gun Control". National Review. ^ "Daily Bulletin: Students Prep the Next Round of School Walkouts for Gun Reform". The Trace. Retrieved 2019-03-09. ^ "New Mexico governor enacts expanded gun background checks". Las Cruces Sun-News. Retrieved 2019-03-09. ^ Alvaro Castillo-Carniglia, Rose M.C. Kagawa, Magdalena Cerdá, Cassandra Crifasi, Jon S Vernick, Daniel W Webster, & Garen J. Wintemute, California's comprehensive background check and misdemeanor violence prohibition policies and firearm mortality, Annals of Epidemiology (October 2018). ^ Wintemute, Garen J.; Cerdá, Magdalena; Vernick, Jon S.; Webster, Daniel W.; Kagawa, Rose M. C.; Castillo-Carniglia, Alvaro (2018-12-01). "Comprehensive background check policy and firearm background checks in three US states". Injury Prevention. 24 (6): 431–436. doi:10.1136/injuryprev-2017-042475. ISSN 1353-8047. PMID 28986427. ^ Rose M.C. Kagawa, Alvaro Castillo-Carniglia, Jon S. Vernick, Daniel W. Webster, Cassandra Crifasi, Kara E. Rudolph, Magdalena Cerdá, Aaron Shev, & Garen J. Wintemute, Repeal of Comprehensive Background Check Policies and Firearm Homicide and Suicide, Epidemiology (July 2018). ^ Danielle Kurtzleben, Research Suggests Gun Background Checks Work, But They're Not Everything, NPR (January 9, 2016). ^ Kara E. Rudolph, Elizabeth A. Stuart, Jon S. Vernick & Daniel W. Webster, Association Between Connecticut’s Permit-to-Purchase Handgun Law and Homicides. American Journal of Public Health (August 2015), Vol. 105, No. 8, pp. e49-e54. doi: 10.2105/AJPH.2015.302703. ^ a b Daniel Webster, Cassandra Kercher Crifasi & Jon S. Vernick, Effects of the repeal of Missouri's handgun purchaser licensing law on homicides., Journal of Urban Health (April 2014), Vol. 91, No. 2, pp. 293-302. doi:10.1007/s11524-014-9865-8. ^ McCourt, AD; Vernick, JS; Betz, ME; Brandspigel, S; Runyan, CW (1 January 2017). "Temporary Transfer of Firearms From the Home to Prevent Suicide: Legal Obstacles and Recommendations". JAMA Internal Medicine. 177 (1): 96–101. doi:10.1001/jamainternmed.2016.5704. PMID 27842186. Editorial board (February 18, 2014). "Missouri study shows why we need universal gun background checks". Chicago Sun-Times. Sun-Times Media. Retrieved June 30, 2014. Krouse, William J. (March 1, 2013). "Gun Control Proposals in the 113th Congress: Universal Background Checks, Gun Trafficking, and Military Style Firearms" (PDF). U.S. Department of State. Retrieved February 17, 2015.